For sale is a brand new steam iron. 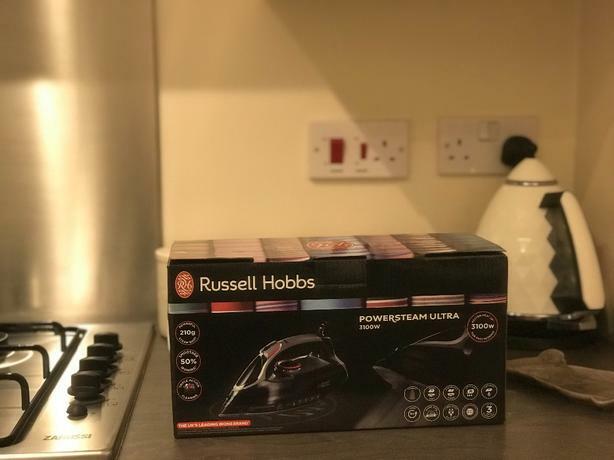 Russell Hobbs RRP £50. Selling for £30. Comes new in box with £50 Wine voucher. In all it's packaging. Can deliver locally. 350ML tank, 3100 Watts, Ceramic sole plate, Automatic shut off (so if it falls over or is knocked/forgotten about it will switch off), Self cleaning function, 45G Continuous steam, 210G Shot of steam, Soft touch dial and handle, 3M Cord, Anti - Scale, Anti - Drip, Dry/Steam/Spray/Burst, powerful vertical steam, precision tip, Button grooves. Gives a long lasting scale free life, 50% smoother than previous models, heat up time is 15% faster, tackles stubborn stains at ease, vertical steam is perfect for getting creases out of hanging items, curtains and upholstery. Can deliver or collection is welcome, 07756620775.